The Grace F9 Series are Japanese made, high-output MM (moving-magnet) cartridges with a flat frequency response across the entire audio range. Frequency response beyond 60 KHz - suitable for all CD-4 records. 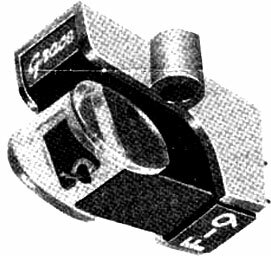 An area of contact on the F-9F and F-9U similar to a cutter stylus - a design based on extensive studies of record grooves and their relationship to an ideal stylus. An F-9F stylus that reproduces the highest frequencies. An F-9E elliptical stylus that reproduces stereo and CD-4 with complete compatibility and excellence. An F-9D and an F-9P with the world standard 16.5u (0.65 mil) conical stylus specified by the lEC for uniform tracking ability. Extremely small magnet made from a rare earth cobalt formulation on each stylus. Extremely light but strong cantilever, made from a special low mass alloy, for excellent transient response. One point support of the stylus assembly which guarantees ideal reproduction in accordance with the laws of motion. Excellent channel balance and low cross-talk through unique matrical-flux magnetic circuit of the Grace cartridges. Universal acceptance by broadcasters and record manufacturers. Optimum performance with interchangeable F-9 styli to match your needs. Grace F9 / F-9 owners manual, service manuals and schematics are for reference only and the Vinyl Engine bears no responsibility for errors or other inaccuracies. The PDF files are provided under strict licence. Reproduction without prior permission or for financial gain is strictly prohibited. This website is not affiliated with or sponsored by Grace. Posted Tue, 05/18/2010 - 15:50 by GLR1980. If you are fortunate enough to own a Grace F9 and are in need of a replacement stylus, you know that new Grace styli are nearly impossible to find. Consider having your old stylus reworked by www.sound-smith.com. The ruby cantilever option provides an improvement in sound over the original primarily in accuracy and warmth of tone that makes it well worth the price. Posted Sat, 08/21/2010 - 06:02 by dubkarma. Could you compare the Soundsmith F9 to other MM cartidges you've used? It's good to know Soundsmith improves on the original, but it would be very helpful if you could compare the upgraded F9 to other MM cartridges with which I'm familiar. For example, the Ortofon OM40 Super, Audio Technica AT150MXL and AT160ML, Goldring 1042, Reson Reca, Shure V15-V-MR? I've had an F9 cartridge for years, but never succeeded in finding a stylus, so, having read your post, am wondering if it's worth the investment. Posted Sat, 08/21/2010 - 16:29 by GLR1980. I have been using a Shure V15 III with a JICO SAS stylus replacement. The original V15 stylus was damaged when I received it. The F-9 with the best Soundsmith upgrade is at least the equal of the V15 in terms of overall "presence". The bass and midrange on both have virtually the same degree of clarity with the edge going slightly to the F-9. The V15 seems to have a very slight edge in clarity in the treble. However, this may be an impedance effect of my cables. I have more experimenting to do with the F-9. I'm afraid I don't have experience with the other cartridges you mention. I find both the V15 and the F-9 to provide highly enjoyable extended listening; each provides a revealing view of the music (mostly classical, a fair amount of 60s - 70s rock, folk.) Perhaps someone else out there has been able to compare their Soundsmith F-9 with high end MM cartridges. I would think a prudent comparison would be with a well regarded cartridge costing at least as much as the Soundsmith refurbishment. I would redo the F-9 again if I had to. It is certainly better than the somewhat worn non-ruby cantilever stylus I had been playing in all respects. Posted Sun, 05/30/2010 - 13:54 by B-Audio. I just had a customer drop by yesterday with a NIB Grace RS-9 Ruby with packaging , inspection tag and all hardware still sealed in plastic and a second box with the RS-9 Ruby Stylus. The cartridge itself does not have a stylus. Trying to find a little more info on the cartrdge as far as value goes for the customer. I am thinking an auction on A'gon or Ebay maybe my best choices. Any input would be appreciated. Posted Sat, 04/03/2010 - 14:57 by Zanzibar. Posted Sat, 09/24/2011 - 01:54 by hifitommy. in a tonearm purchase some time ago i got a black 707 with an f9 mounted and at first i thought it was an e. now i am not so sure as the plastic shroud which is green on the E and red on the R is clear or ever so slightly yellowishly off clear. is this an L? an where does that rank in comparison to the e. i will assume luminal trace is like a microline, fineline, or microridge. is this a correct assumption? i have yet to play the cart but i could mount the stylus in my E body which is in my mmt arm.